[Review] Sig Sauer P938: Tiny 9mm 1911 Goodness? With dozens of compact or sub-compact semi-auto pistols on the market, its hard for any of them to stand out. Some manufacturers try to throw add-ons or gimmicks on their guns to try and catch your eye when you’re looking over the sea of normality at the gun counter. Others, like Sig Sauer, just focus on making an amazing product and letting their work speak for itself. Let’s see if Sig’s 9mm P938 is the right micro-gun for you! The Sig Sauer P938 was introduced at the 2011 Shot Show. For shooters who gravitate toward 1911 pattern handguns, the P938 offers a sub-compact, easily concealable handgun that will be an easy transition from a full-size 1911 handgun. If you cruise over to the Sig Sauer website you’ll find a nearly endless list of selections on the handgun pages. 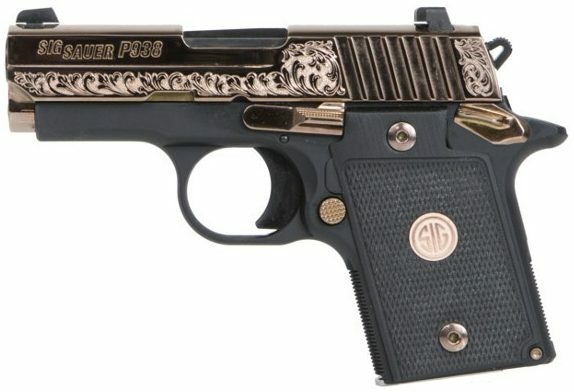 The P938 alone is currently offered in 15 variations. This particular review will focus on the Scorpion version of the 938. This little handgun found its way home to our gun safe when it pulled my wife to the gun counter at Cabela’s like a Star Trek tractor beam. While there were numerous models to choose from the Scorpion’s good looks and the Sig Sauer logo on the grips pretty well made the decision for us. You have to understand though, my wife’s first handgun and primary carry gun for many years was a Sig P220. The first thing to note is this gun is small. With the supplied 6-round, flush fit magazine you could easily carry this in a pocket or purse and never even know it’s there. However, if you have big hands or long fingers you may find that the grip is too small for you. While comfortable in my hand, I found my trigger finger position was a bit different than on bigger guns and pretty consistently pulled my shots a bit low and left at the 5-yard range. For my wife, her shots were consistently centered on her point of aim. The gun is finished in a Flat Dark Earth color with Hogue G-10 grips that are a handsome laminate with green, tan and light brown. Sights are the awesome Siglite Tritium Night sights in a 3-dot configuration that are easy to pick up in full daylight and are super bright and sharp in low light. Controls are predictably where you would expect them to be on a 1911. The slide stop is on the left side as is the magazine release. The Scorpion comes standard with an ambidextrous safety that allows for safe, confident Condition One carry. There is no grip safety on the P938. With regards to manipulating the controls on the P938, I did find that with my larger hands sometimes the magazine would hang up on the bottom of my palm. If I adjusted my grip, the magazine ejected smartly. I also found that a couple of times I was riding my support hand thumb on the slide stop and caused the slide not to lock open on the last round. Again, a bit of grip adjustment and the slide locked open every time on the last round. I have spent a couple of days with the gun at the range and probably run about 300-400 rounds of 9mm total through it so far. The majority of my shooting has been with handloads consisting of 115 gr Berry’s Plated Round Nose bullets. I experienced no failures to feed, fire, and eject, other than the above mentioned issued of riding the slide stop and not having the slide lock open. With the handloads I found it easy to keep my 5-yard off-hand groups at about 1 1/2”. Surprisingly the little gun is very well behaved and easy to control, enough so that my 12-year-old nephew had no problem shooting it. Firing quickly with 5 rounds loaded in the magazine I tended to string my shots vertically. As the day went on, my rapid-fire groups began to shrink as I continued to work on my grip position. Most of my shooting was at the 5-yard mark. 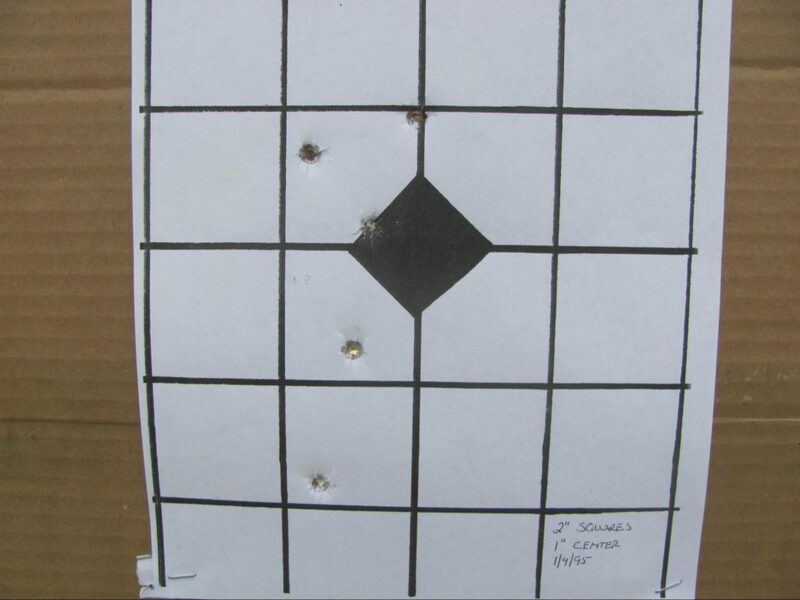 However, I did run a couple of magazines downrange at a 12”x12” plate at 35 yards and hit the plate every time. Likewise, we have an 8” round plate at 65 yards and I hit it 2 out of 10 tries. At both 35 yards and 65 yards, I held on the top right edge of the targets at about the 2 o’clock position. Reloads were quick and easy once I adjusted my grip to allow the magazine to eject and fall free. A quick rack of the slide and the gun was ready to run again. Retract the slide and inspect the breach to be sure the gun is unloaded. Line up the takedown notch with the slide stop, push the slide stop out of the frame and ease the slide off the frame. The recoil spring and guide rod lift out easily. The barrel is then easily removed for cleaning. 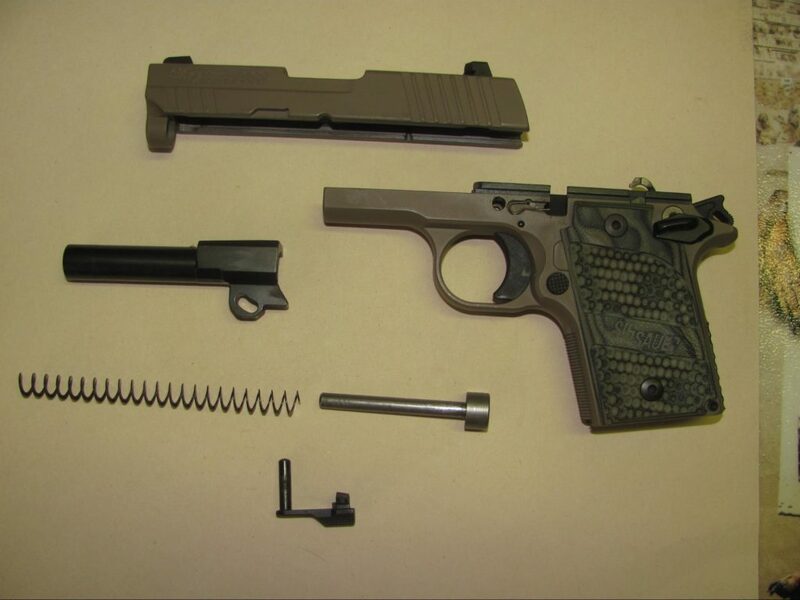 To reassemble the gun after cleaning, reverse the takedown procedure. Just be sure to press the ejector down and forward before moving the slide all the way to the rear. I experienced no issues with the Sig as far as feeding, firing, ejecting. No stoppages, no failures. Like all Sig products, I believe this gun will serve you reliably for many years. The gun grouped well at the 5-yard range I tested it at. 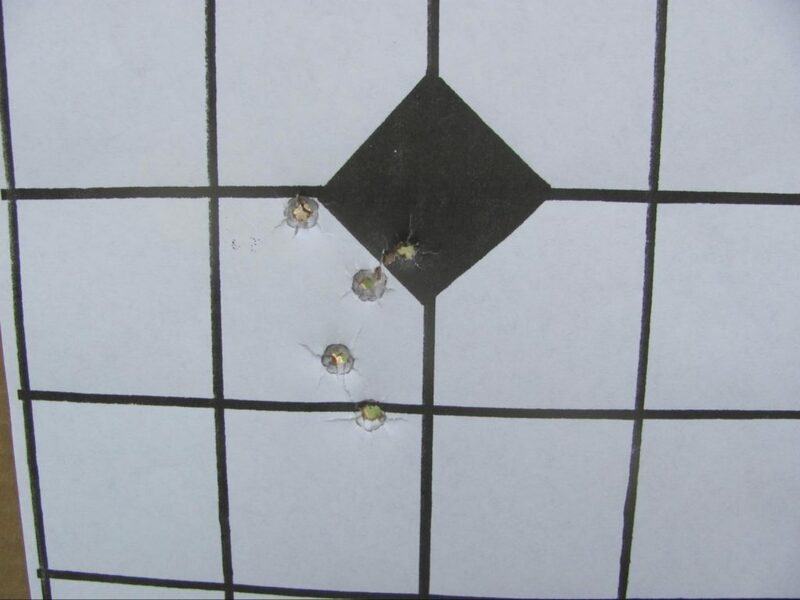 Though my groups were a little low and left, I feel my grip and hand size were more to blame than the gun or sights. Hitting steel out to 35 yards was not a problem. The controls are easy to manipulate and reach. This gun is a sub-compact model and as such it is small. Those with bigger hands may find like I did, that they need to modify their grip somewhat. Practice makes perfect and training with your carry gun so you are confident and consistent will be important with the little P938. This gun drew my wife to the gun counter like a magnet. I’m a fan of the Flat Dark Earth color and the grips. The Sig really stands out from the blued steel and stainless crowd. 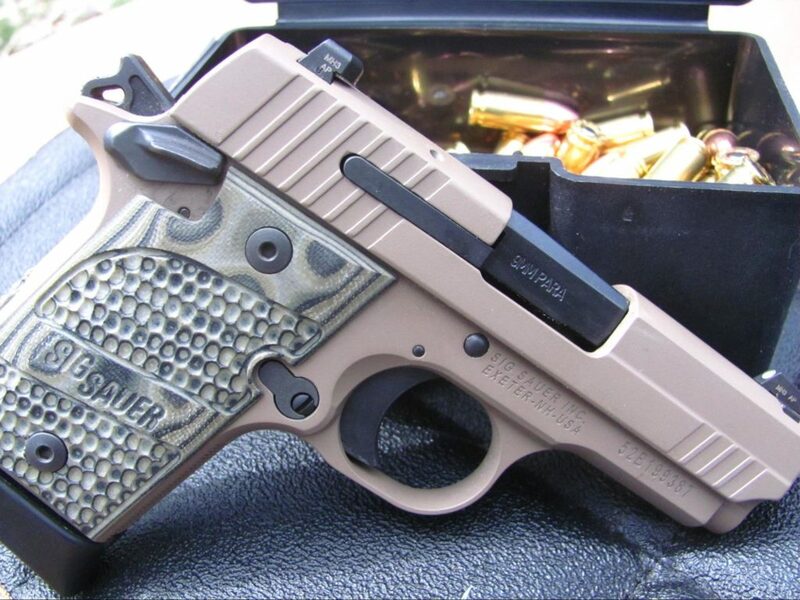 Sig also seems to make the P938 in almost every flavor and color. I give the P938 a low mark here only because there is not much that can be or needs to be done to it to provide a quality concealed carry option for you. There is a .22 LR conversion kit that used to be available from Sig Sauer that will allow you to train with cheaper ammo, sadly it seems to have been discontinued. If you’re interested in trying to find a used one, Lucky Gunner took it for a spin and reviewed it before it was discontinued. There are no cheap Sigs. The P938 is no exception. With a suggested retail price of around $700, you need to be sure this is the gun for you. The Sig reputation for quality and reliability justify the price for this gun. 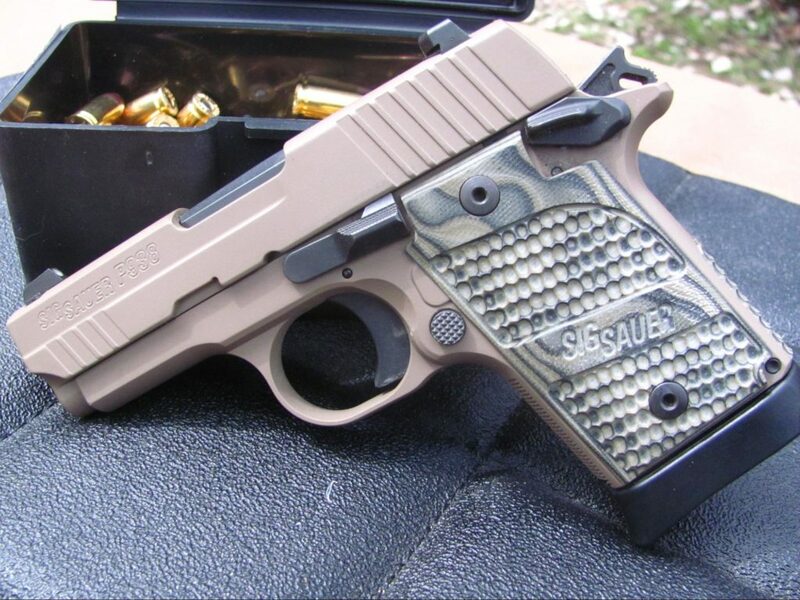 Make no mistake; I am a fan of Sig Sauer handguns. The P938 is just the latest model to find its way to our safe. I find that I reach for the P938 more and more frequently when I am getting ready to head out the door. Tucked away discreetly in a Simply Rugged Cumberland holster I feel confident the Sig is up to any task I ask of it. Until next time, Aim Small…Miss Small. Got a Sig P938? How do you like it? Do you carry a different 9mm CCW? Let us know all about it in the comments! I have the same little 938 in FDE. It performs like a champ. I have experienced a few FTF’s but quickly found that this was due to a follower in one of sig’s 7-round mags(much more comfortable for my larger hand purchase) was hanging upon the last two rounds loaded. I have the BRG version with the 7 round mags. This makes the grip big enough for my average size hands. The SAO trigger is great for me and the size is very concealable under a t-shirt with the supplied OWB holster. I use this as my EDC. You know they make these things called “Pocket Holsters” that you can put a gun in right? Yeah, of course I’m familiar with pocket holsters. But given the description above, it doesn’t sound like it’s “perfectly safe” to carry that way, does it? Maybe I’m narrow-minded, but I believe a well-designed holster should protect the safety from being unintentionally disengaged. They say that “Beauty is in the eye of the beholder, but ugly is to the bone!” -Yikes, that thing is ugly and there seem to be quite a few more functional & better-engineered 1911-style choices as well. I’ll take the Springfield EMP4 Carry Contour over the Sig any day of the week. More rounds, comfie grip, highly accurate, just as concealable and pure undeniable beauty. Great for southpaws too! As nice as it is, the springer is also a larger pistol….